My first impulse is always to skip the iconic places, but I always end up going there anyway - they've become icons for a reason. 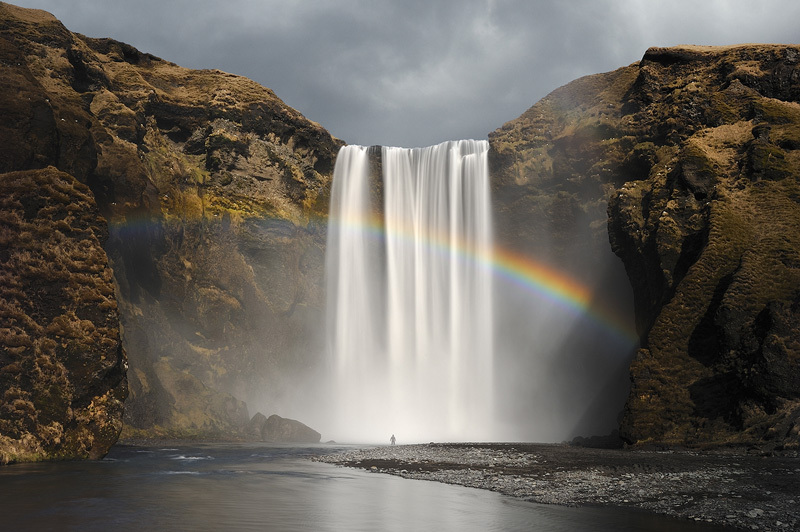 Skógafoss in Iceland is one those icons. It drops 60 meters over a cliff and is fed by melting water from the glacier above it. I haven't seen much direct sunlight in Iceland, but on my second visit to this location it was sunny one moment and heavy clouds the next, and vice versa. Usually I'm not a big fan of front light, but in this case it really helped to bring out the rainbow. I waited for a dark patch of clouds to move into the background and asked Daniella to walk up to the falls to add scale to the shot.